DATE: January 13, 2011 -- TIME: 4:00 p.m.
PLACE: Commission Chambers, Collinsville City Hall, 106 N. 12th St.
Notice and agenda filed in the office of the City Clerk and posted at City Hall at 3:00 p.m. on Thursday, January 6, 2011. 4. 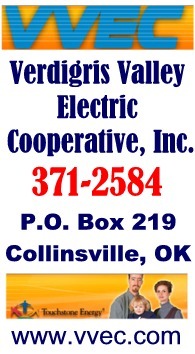 PUBLIC HEARING  Review, discussion and possible action regarding the Collinsville City Park Master Plan update. -- The park board approved an updated version of the park master plan concept (changed since the graphics on this page). Changes include a storage building and an additional picnic shelter near the splash pad. The board also approved two grant application proposals.One for a new 8 foot wide concrete trail in the park with 20% city matching funds ($49.4K) for $160K in from an "Oklahoma Recreational Trails Plan Grant" totaling $209,474. That trail would be on the east side of the park. 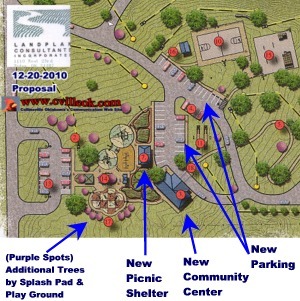 A second potential grant from "Land & Water Conservation" could provide 50% matching funds for $306K total improvements including 2 new covered picnic shelters near the splashpad/playground, partial parking areas and a connection to the new path, and additional landscape near the splash/play area. The estimated city cost would be $202K (for both) and is available from 2009 bond (sale tax increase) funds according to City Manager Pam Polk. The topics will likely be on the next city commission agenda as the deadline for the two grant applications is the end of this January. Grant notification could come mid-year for a 2 year completion cycle. 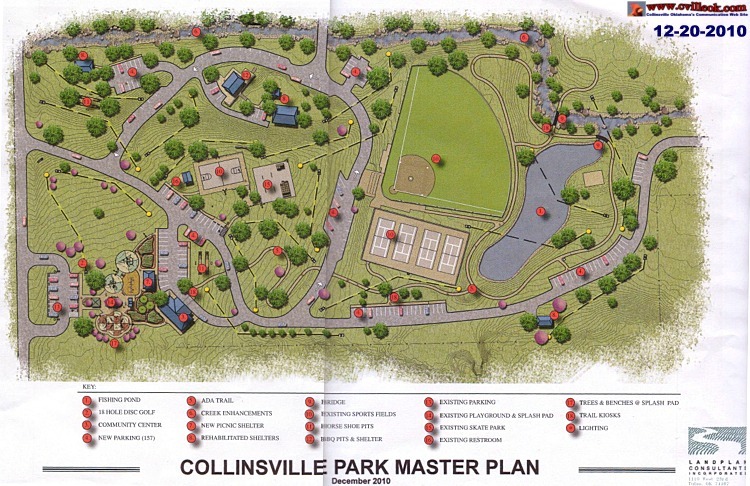 This new drawing by LandPlan Consultants show the latest proposal for the master plan at Collinsville City Park. It incorporated all the new park features which became reality in 2010 as well as many more that could be considered in the future.